These are way too easy not to make your own! ¾ cup (1 ½ sticks) unsalted butter, almost room temperature. In a food processer, cream the butter and sugars together for about 30 seconds. Add everything except the flours and pulse until combined. Add the wheat and all purpose flour and pulse until just combined. Turn out onto a clean surface and knead a few times until combined. Wrap in wax paper and put in a container with a lid. Let rest in the fridge for about an hour. Pre-heat oven to 350 degrees. Line 2 baking sheets with parchment paper. Lightly flour a clean cutting surface. Separate dough in half and kneed in your hand a few times. Place on surface and sprinkle with a little flour. Using a rolling pin roll out dough just under ¼ inch thick. Using a pizza cutter, slice off jagged edges, next slice the dough into squares. Place squares on baking sheet and repeat with remaining dough adding the scraps from the first rolling. Bake for 9 to 11 minutes. Let rest on the baking sheet for a minute, and move to a cooling rack. Notes: Freezing unbaked cookies on the baking sheets for 15 minutes will help them hold their square shapes better. Recipe & picture by Laura Flowers. Yes! I hope you like these. I'm definitely giving these a try! Thanks for sharing. Can't wait to try these. Thanks for sharing them! These sound so yummy! 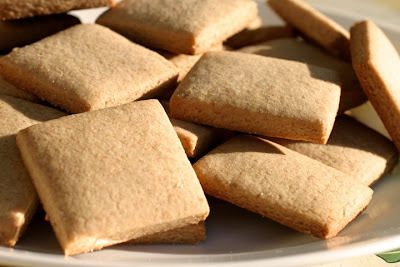 My children and I love graham crackers...can't wait to try your homemade version! Have you tried egg replacer? Another option maybe, add baking powder like a biscuit and see if it helps it rise. You would have to add a little extra liquid of course. Smores Cookies, my Martha Stewart winning recipe.